Intellectual Property is a strategic business asset and in many cases is the most valuable asset a company owns. Many times in this blog and in our newsletter we have discussed the strategic importance of IP and numerous perspectives from which to view it. We have looked at the strategic importance of IP from the perspective of the IP Value Chain. We have looked at the importance of IP using various innovation metrics as a proxy for IP, including the S&P Global Innovation Index . We have discussed the importance of portfolio management, and related it to stock price appreciation in the Ocean Tomo patent index. We have looked at it in the context of under-reported royalties related to IP causing revenue to literally leak out of corporations. We've discussed the fact that countries from China to the Barbados have national IP strategies. I recently came across an excerpt of a study done by the folks over at Steel City Re. Over the course of several years, they have correlated superior IP management at companies with above average return to shareholders. I haven't looked at the details of the study, but it seems that it should be a powerful tool for IP departments to help justify budgets, resources and head-count with executive management. For every chief IP counsel, officer, strategist or attorney currently getting squeezed between the demands of properly managing their IP portfolio and ongoing budget cuts, the research over at Steel City Re may help steer the conversation away from IP as a cost center to IP as the basis for superior shareholder returns. "Steel City Re has amassed a significant amount of empirical data from this index showing that superior managers of corporate intangible assets (reputation) reward shareholders with above average equity returns. 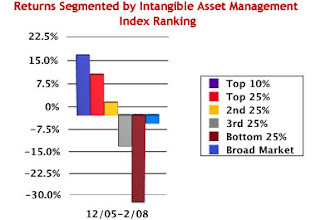 The data, viewed retrospectively, show that companies whose index rankings place them in the top 25% of the 2,483 companies studied during the 28 month period from Dec 2005 to Feb 2008 rewarded their shareholders with an average (portfolio) return of 18% which is about three times the market return of 6%. Moreover, companies whose IA management was very good and who continued to improve, delivered outstanding returns. Among the companies whose average index ranking was in the top 25%, those whose index rankings did not decline during the 28 month period, numbering 290, rewarded their shareholders with an average (portfolio) return of 50% which is about three times the group average. Companies whose index rankings declined, numbering 331, rewarded shareholders with average (portfolio) returns of -6%. In an ongoing series of studies, our data consistently show that superior stewards of intangible assets reward their shareholders with returns that are on the order of three times greater than their peers." The next time your corporate budget committee treats the IP department as a mere cost center and asks you to absorb yet another round of budget cuts and head count reductions, remind your executives that they have an obligation to shareholders to equip the IP department with adequate resources and the solutions they need to help manage the company to superior shareholder returns.